By pursuing and achieving accreditation, Behavioral Health Resources, LLC has demonstrated that it meets international standards for quality and is committed to pursuing excellence. Click here to view the 2017 Survey Report. For this last survey, we did not receive any recommendations. This occurs in only 3% of CARF-accredited organizations. We’re very proud of our clients, personnel, and stakeholders for assisting us in this process. 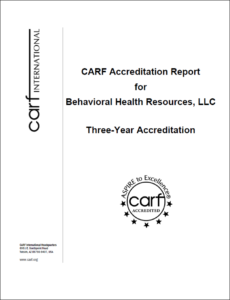 This accreditation decision represents the highest level of accreditation that can be awarded to an organization and shows the organization’s substantial conformance to the CARF standards. An organization receiving a Three-Year Accreditation has put itself through a rigorous peer review process and has demonstrated to a team of surveyors during an on-site visit that its programs and services are of the highest quality, measurable, and accountable. Better Business Bureau (BBB) – We support and contribute to the Better Business Bureau’s mission of fostering trust and accountability within the community through honest and ethical business practices. Click on the BBB Logo below to view our accreditation status.